It’s not exactly news of North Korea and the dangerous game of nuclear chicken they’ve been playing with America and the rest of the free, rational world. It’s not of the plethora of liberated sexual harassment and / or battery claims being leveled at many of the nation’s most trusted male politicians and entertainers since the Harvey Weinstein case first broke in November. And it’s not even as serious as the injury exit of GB’s 2-time MVP Aaron Rodgers who we all know will return before Lambeau leapers jump out any windows. But the benching of the Giants future Hall-of-Fame quarterback Eli Manning (1.3.81) in favor of Geno Smith, well, that is, in Chiefs-of-Staff parlance, a move whose questionable judgment might ultimately make that which shaped the 1961 Bay of Pigs invasion look a little less flawed in comparison. The New York Giants 2nd-year head coach Ben McAdoo, apparently with owner John Mara’s blessing, decided earlier this week to sideline the 2-time SuperBowl winning signal-caller, both title wins versus the mighty New England Patriots (2008 / 12), in an effort to jump-start the G-Men’s 2017 season (2-9), one which’s been on the cinder-blocks for quite some time now. Eli, the younger brother of the recently retired Peyton Manning (2016), is playing in his 14th season out of Ole Miss. He’s been healthy this season and putting up fairly decent numbers in (62.5%, 14t-7i, 2411). The touchdowns and pass-yards are down significantly but then his top receivers in Odell Beckham and Brandon Marshall went out early with ankle bangs. 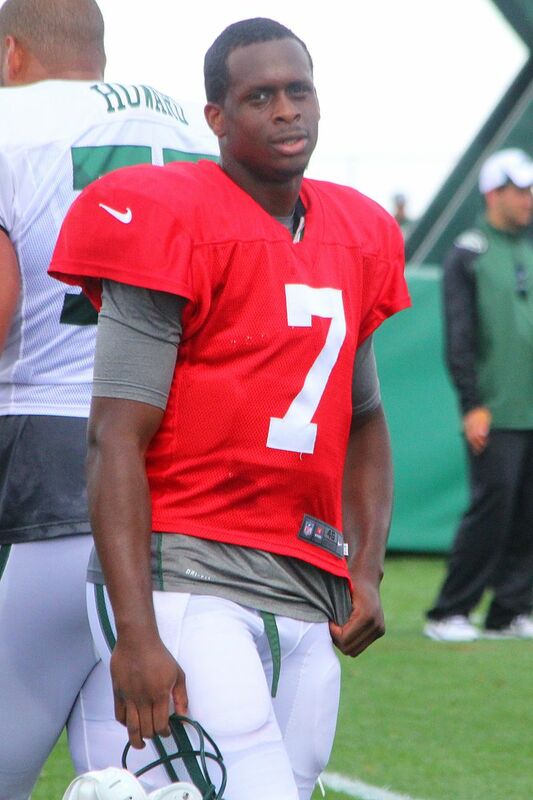 How will the former Jets starter Geno Smith fare? It’s hard to imagine it’d be any better than did Mr. Manning. And that’s being generous. Like his predecessor, Smith (12-18, 57%, 28-36) will have benefit of a capable OL (26sk) and fine run tandem in Orleans Darkwa (4.6) and Wayne Gallman (4.1). But Gino too will be trying to turn an offense ebbing low in key team stats (#28 yapg / 31 pppg), a direct result of the depleted receiver corps in a League that just won’t permit much success on a ‘3-yards-and-a-cloud-of dust’ game plan (Defense: #31 / 22). 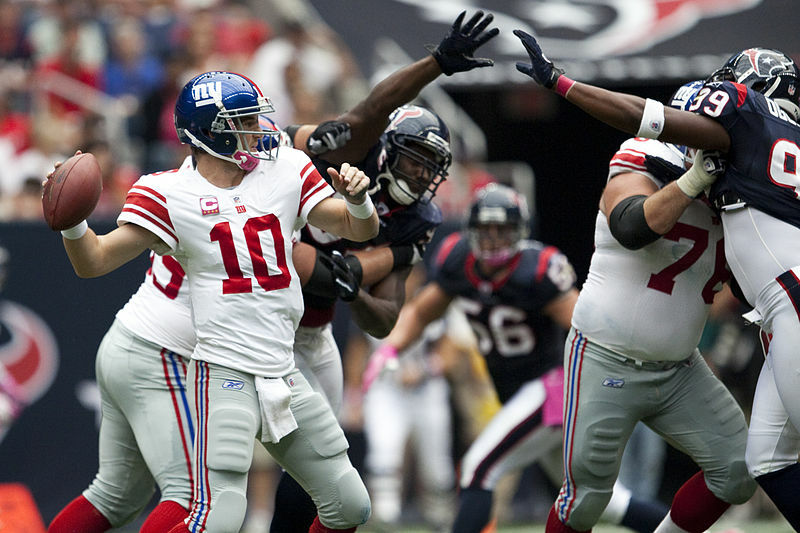 As for stanchion Eli, where exactly his NFL road takes him is unmarked at this point. Manning may end up back in the starters spot before this season’s end, his handlers hoping he uses this time on the sideline to refocus, recharge his batteries, or, he may remain a clipboarder for the remainder while the Giants shop him services, contract permitting. It’s all a shocking turn of events in MetLife land. It’s shocking to those of us who follow NFL football and know the dearth in quality quarterbacks, only to get worse with the no-read, flash-QB so popular on the coaching-lite collegiate scene, all making this a very odd time for the franchise to (maybe) be ‘moving on’ from the Manning era. And then, seven INTs on a 2-9 record ain’t exactly throwing the season away, oy vey.